Every culture has stories of vampires and magical creatures that regain their youth by drinking the blood of their companion who in turn becomes old and wisened. Life imitates art, and sometimes on a celestial scale. Using AstroSat, India's dedicated space observatory, scientists have discovered that something similar was behind the prolonged youth of a star in the sky. Stars are born, lead a long and stable life and then die, sometimes in a spectacular fashion. Stars can have variety of masses. The mass of a star almost completely determines its life pattern as well as the nature of its death. Astronomers know that heavier stars are warmer and bluer in colour than slimmer ones. They also know that heavier stars race through their mid-life over a span of few million years and then die while the lighter ones burn sedately for billions of years. Let us suppose there is a bunch of stars of different masses that formed together at the same time. This system of stars is known as a Globular Cluster and our galaxy has more than 150 of these clusters. What would we find if we looked at them a few million years later? We would naturally expect that all the bluer, hotter, heavier stars in the system would have died, leaving behind only the redder, cooler, less massive ones. However, when astronomers looked at stars in such clusters in the 1950s, they were astonished. They found some stars in old clusters that were massive and blue and had no business to be alive at all. These were named Blue Straggler Stars, or BSS. How did they manage to be alive and kicking? A team of scientists from Bengaluru-based Indian Institute of Astrophysics (IIA) has now cracked the mystery in association with their collaborators from America, Canada and Chile. The secret of prolonged youth of these stars is simple, yet strange. This happens when two stars orbit each other in a binary system. When the more massive star evolves, it becomes so big that the second, redder star swallows its outer layers. The first star loses much of its mass and lapses into leading a more boring life. The second star, now bloated after a heavy stellar lunch, becomes massive. It then turns into a bluer and hotter star. It can now masquerade as a young star to an unsuspecting astronomer. The scientists used the Ultraviolet Imaging Telescope (UVIT) on board AstroSat, to look at one such Globular Cluster called NGC 5466 in our galaxy. 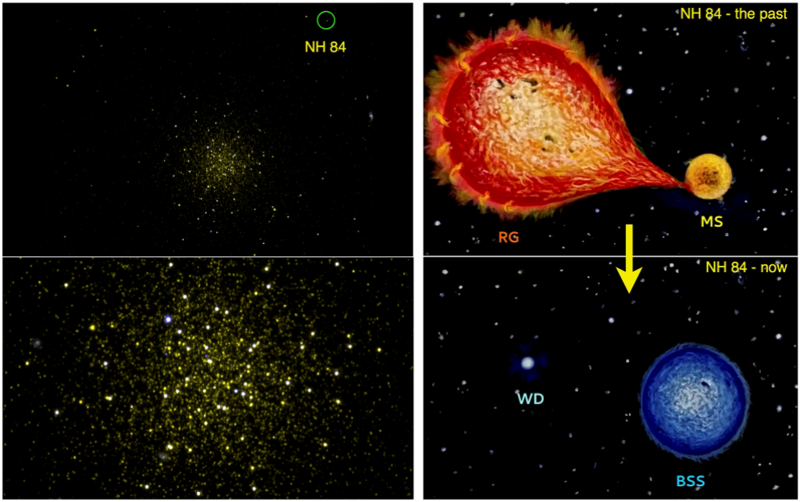 “We identified 14 Blue Straggler Stars (BSSs) as part of the cluster, and our attention was drawn to a particular BSS, named NH 84”, says Annapurni Subramaniam, a co-author from IIA. “We combined our ultraviolet measurements along with other data in the optical and infrared to model NH 84. We found that it was even brighter in the high frequency end of UV than what the model predicted”, says Subramaniam. The team then calculated that the Blue Straggler Star was a bit more massive than our Sun with a temperature of 8,000 degrees, whereas the White Dwarf was about half as massive as our Sun but much more hot at 32,000 degrees and whose size was only 2% that of our Sun. The Blue Straggler Star had clearly swallowed up a large part of the outer layers of its companion star to become bluer and hotter. The white dwarf is all that remains of its companion now. This is only the second Blue Straggler Star plus White Dwarf pair known in a Globular Cluster. Dr. Subramaniam and her team had previously discovered a Blue Straggler Star in another cluster, orbiting a star in its old age, using the ultraviolet imaging telescope. Its future would be something like that of NH 84. “We have identified other Blue Straggler Stars in our ultraviolet imaging telescope image and will be studying them closely now. We are waiting to discover how these stars managed to get back their youth as well,” said Snehalata Sahu, a PhD student at IIA and first author of the research study to be published the Astrophysical Journal.